Crestview Local Schools has a long tradition of excellence in academics, fine arts, and athletics. Much of this success can be attributed to the strong work ethic that has been instilled in our students by their parents, the community, and the staff here at Crestview. The district is financially stable and it has a long history of being fiscally responsible. Our facilities and school environment are excellent. Crestview focuses on the core academic subjects and specialty areas. Fine arts, Mass Media, and yearbook classes are offered throughout the day, along with academic clubs and organizations that meet after school. These clubs and organizations include Scholastic Bowl, Student Council, FFA and FCCLA. Because of our K-12 campus, various programs and opportunities are available for interactions between elementary, middle, and high school students. 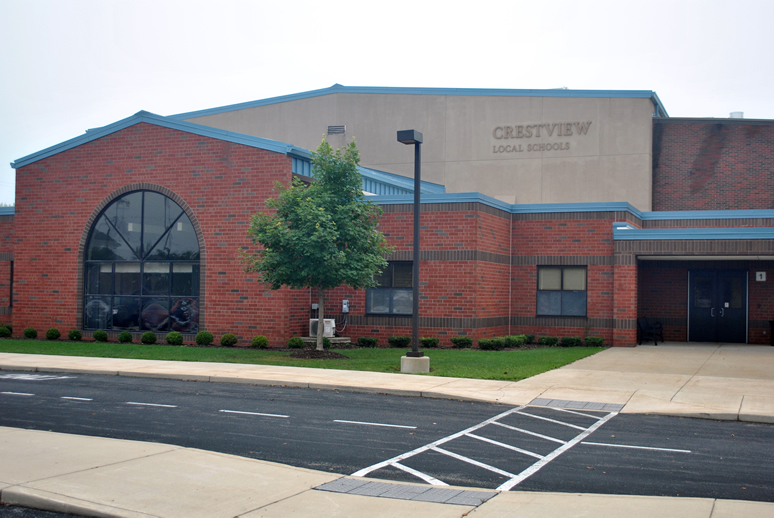 Crestview Local Schools is dedicated to seeing that students receive a balanced education in a positive environment. Crestview has had a strong tradition of excellence in education. This concept is one that Crestview educators take very seriously, and Crestview will continue their tradition of providing students with top-notch, quality, learning opportunities. Board of Education members: John Auld, President, Lori Bittner, Nanette Grace, Jake Sawmiller, and Andy Perrott. 130 total employees including those listed above as well as educational paraprofessionals, bus drivers, cafeteria workers, secretaries, custodians, etc.